THE WHITE WONDER: GOING OUT WITH A BANG! In the early Summer of 2001, I finished law school at the University of Idaho and moved with the family and Farley to work as a law clerk for the Honorable James J. May in Hailey, Idaho. We ended up living in Picabo, Idaho near Idaho’s renowned Silver Creek. As a diehard fly fisherman, this was by design, of course. With the move came the need to find new coverts to hunt in the fall. In talking with a new friend, Tom John, I informed him that I was an upland game hunter with a crazy pointer. In turn, he reported to me of an intriguing place in South-Western Idaho “with valley quail so thick I once shot six quail with one shot.” While that may seem hard to swallow, we were in church when he said this so that’s got to count for something. In the Chapter, “Outshooting Matt,” I tell about my first visit to this awesome covert, we now call, “The Trail to Quail,” in November of 2001. Having experienced such bounty, I wanted to go there with Farley one last time before the season closed on January 1, 2002. With the holidays and family time, my only opportunity fell on Saturday, December 29th, one of the last days of the hunting season and the year. 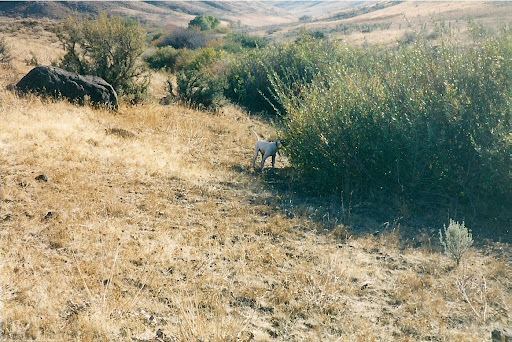 Farles, on one of his many exploits at the Trail to Quail. Along for the trip were my brother, Scotty, our friend, Troy Justensen and his French Brittanys, Duke, Molly and Daisy. Incidentally, Molly and Duke happen to be the parents of my own Sunny Girl, who I took home the following year in July of 2002. With it being winter, there were patches of snow three to four inches deep in some areas and we observed quail tracks everywhere, no doubt, a good sign. That morning, at the mouth of the canyon, we split up. Farles and I took the right-hand side of the big draw and Scotty and Troy hunted the left with his dogs. As before, Farley and I quickly got into copious amounts of quail. Farles did great, but with all the birds ripping around everywhere, I was a nervous wreck. Undoubtedly, valley quail have that effect on newcomers to the sport. I sent lead in all directions to no effect. 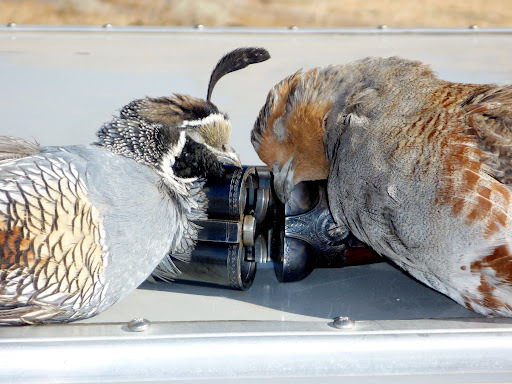 As it was late in the season, the quail grouped together into huge coveys. In fact, we flushed a covey so big, it fanned up a steep hill into a small saddle. There had to be at least fifty birds. Before that time, I had never seen such a large covey while hunting. Farles locked up on point in a willow clump in the creek bottom. Farley and I followed with a new intense focus and, when we arrived at the sage-covered saddle, the White Wonder put on an exhibition of bird-finding and pointing. I kid you not, there were quail in every single sage brush in the saddle and they flushed in singles, doubles and more. Farley went from bush to bush pointing each one. In short succession, we had three birds in the bag. I honestly went three for three and then missed a bunch when I started thinking about how great I was shooting. This was one of the most intense five minutes of hunting I have ever experienced. As usual, Farley was absolutely amazing. After the flurry of activity, I decided to go find Scotty and Troy so we could get some lunch and meet up with Tom John, who happened to be in town because of the holidays. As I walked down the old two track, Farley again locked up on point. I walked in and a great covey of Huns flushed in unison and crossed in front of me right to left. As I observed their tight formation, I thought: I can’t miss! So I swung and pulled the trigger. To my amazement, one bird faltered, but did not drop immediately. Rather, it flew about 100 yards and then dropped. Right then, Troy and Scotty showed up with Troy’s dogs. 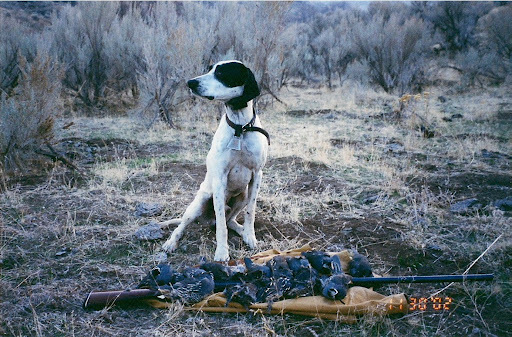 Troy had already taken numerous quail and one chukar. On the other hand, Scotty only had a few quail, but unlike me who’s shooting strategy at the time was to shoot quickly and often, Scott carefully picked his shots. Looking back, I shot so darn quick with my Remington Semi-Auto that my first shot was usually wasted and then I tried to quickly recover with the second and third. Fortunately, with my current over and under, I have learned to not be so hasty and make the first shot count. I asked Troy to have his dogs help me and Farles find the downed Hun, which happened to be the second Hun I had ever taken. Needless to say, I wanted desperately to bring it to hand. As we pushed across the bench to where the bird had fallen, the dogs quickly found the wounded bird, but competitive Farley and Duke tore into each other and Troy and I physically separated the two knuckleheads. Farley had a bloody gash on his head above his eye from where Duke chewed on him. That Duke was one tough Cookie and Troy eventually had to put the dog down after he lit into one of Troy’s nieces causing $10,000 worth of damage and medical bills. This was a sad ending for an otherwise great bird dog. After lunch, we drove over to meet Tom John in a small community in Western Idaho. Tom first took us to his father’s property along a small river, but we saw few quail and no pheasants as we hoped. So Tom took us up on this hillside near this blackberry bramble at least 50 yards long. The problem with this locale was that the berry patch happened to be within a stone’s throw from a home. I’m always very reluctant to shoot anywhere near houses as this is a good way to tick people off even if you are being careful. We sent Farley into the bramble and he commenced flushing waves of quail. If the covey from the morning was big, this one was astronomical. I would estimate 100 to 200 quail. The bulk of the birds lit on this rocky and grassy hillside with very little cover where they held extremely tight. As this area was a pretty good distance from the home, I felt more comfortable shooting. Valley Quail and Huns, the birds of Trail to Quail. Again, Farley went from point to point and I again went on a three-bird streak, but that was the extent of my shooting glory for the day. I missed so many times in a ten minute stretch that it was simply pitiful. I recall Farles giving me that look of disgust a dog sometimes exhibits to his poor-shooting master. My shooting never could live up to Farle’s greatness in finding and holding birds. 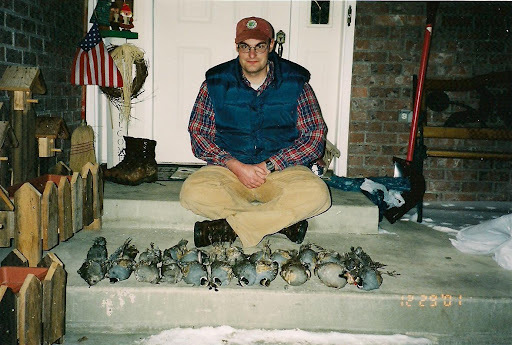 In contrast, Troy quickly filled his ten-bird limit with his smooth mount and swing. We ended up going back to the Trail to Quail Covert for the last hunt of the day. As we drove up the canyon road, we witnessed a hawk dive-bombing another chubby covey taking one of the plump quail in the process. It was at once awesome and sad. We hunted up past the old homestead and up the nearby finger draws as the failing sun began to set on the season and the year’s last hunt. Andy sitting in front of a pile of birds from this late-season quail hunt. In my experience, hunting in Idaho in December is typically an exercise in scarcity and frustration. However, bar none, this is the best day of hunting I’ve ever experienced this late in the season. Farles, the White Wonder, put on a performance to remember. No doubt, Farley always knew how to go out with a bang! That sure is a special place…thanks for the memories!